Read all instructions before installing fixtures. Retain for future reference. For your safety, this fixture must be wired in accordance to local electrical codes and ordinances. All work should be done by a qualified electrician. Make certain power is OFF from the electrical panel before starting installation or attempting any maintenance. 1. Turn power OFF from the electrical panel before starting installation. 2. Locate a suitable position to plate the fixture and open in accordance to the cut-out dimensions (refer to Cut-out info for appropriate size). 3. Run electrical wire from the switch (power supply) through the mounting hole-use NMD90 Romex or BX cable. 1. Connect the fixture to the hardwire box by inserting and twisting the male/female connectors. 2. Push spring loaded clips on the fixture upwards and insert fixture base in to mounting hole. Release the clips and fixture will be pulled flush to the ceiling. 3. Once assembly is complete, turn on power to confirm fixture is working properly. 6 1/4 inch (158mm), follow cut-out template to drill the drywall. JULLISON has provided the dimmer switch compatibility chart for guidance when selecting a dimmer and lamp combination. The slim panel was tested for the compatibility with the above listed dimmers. Dimmers that do not appear on the chart might still be compatible but have not been tested. All testing has been performed with a stable main supply. 1. 6" round LED light fixture with isolated external driver installed inside junction box. 2. 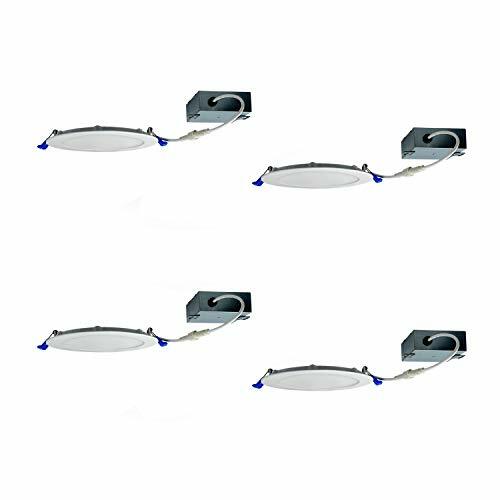 Ultra-thin, 1" thick LED fixture, edge-lite, consumes 12W, emits over 800lumens at 3000K and CRI 80+, offers pleasant light and less glare to eyes. 3. Type IC rated, approved for direct contact with insulation and NO pot light housing is required; Air-tight and suitable for damp and wet locations. 4. For new construction, insulated and dropped ceilings, easy to install into the 6-1/4" cut out. 5. Dimmable with most of the regular triac dimmers in USA and Canada; cETLus and Energy Star Certified. If you have any questions about this product by JULLISON, contact us by completing and submitting the form below. If you are looking for a specif part number, please include it with your message.